On this Spanish instrument, dated 1596, a later correction for magnetic deviation has been made and recorded by a certain Ravizza in 1799. The dial is very similar to the other surviving dials by the maker Juan Cocart. Like them it is preserved in remarkably good condition, with, it seems, its original compass glass and needle. 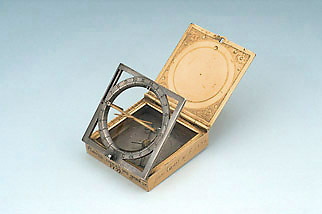 In its square form it is not unlike another dial by a maker who worked in Spain, Petrus ab Aggere (see Epact 59456).